“In the summer of 1956, I went to visit some relatives in Portsmouth Ohio. I knew somehow it was going to be a special Sunday. I went to my first bar-b-que, had my first beer, and stole my first kiss. When we got back to my aunt and uncle’s house, everyone was hovering around the TV set mesmerized by some singer who’s on the Steve Allen TV show. “I’m excited when my uncle Mick tells me that a famous songwriter Sid Wyche (“Whole Lotta’ Shakin’ Goin’ On”), has just renteds the second story of his two-family house. As I start to walk upstairs to play Sid a few of my songs, he runs down the stairs nearly knocking me and my uncle over. He apologizes, and excitedly says, that he just got a $10,000 check from Hill and Range Music, as an advance against royalties for a song that Elvis Presley just recorded, “Big Hunk Of Love”. Sid momentarily forgets that his wife is waiting for him in the car to go cash the check and takes us upstairs to play us Elvis’ record. “After being a staff writer at Aldon Music (Carole King, Barry Mann, Neil Sedaka, etc. ), and working with songwriter/producer Paul Vance (“Itsy, Bitsy, Teenie, Weenie, Yellow Polka Dot Bikini”, “Catch A Falling Star”), I went independent. Although Col. Parker, calls and tell Ben and Me, that Elvis loves the song, and we’re definitely going to be in the film, we’re knocked out at the last minute by a beautiful songwriter, who is on the set and has Elvis’ ear (among other things). Ben and I continue for the next year and a half to work on Elvis movies. Writing for, “Kid Galahad”, “Fun In Acapulco”, and “Kissin’ Cousins”. Unfortunately, none of our songs are used, but I treasure the advance checks we would receive from Gladys Music, which had Elvis’ picture on them! I swear I’ll never cash them unless I really need the money, which is usually an hour or so after I have the check in my hand. May you Rock In Perpetuity! Special thanks to Scott Shannon, Eddie Hodges, Bobbi Cowan , Alan O’Day, and Steve Binder, for their contributions to this tribute. Artie, This is indeed a wonderful surprise anthology. As one pop writer to another, I know the deep influence that Elvis had on our own work. And as a fan, I miss the days when an idol seemed “bigger than life”! I remember my high school innocence, my passionate love affairs that existed purely in fantasy, and the exquisite pain at being rejected by a girl I worshiped. It was probably the same week that I had bought the 45 of Heartbreak Hotel. But when I discovered the breakup ballad “I Was The One” on the “B” side, it reached right through to my heart. The lyric spoke to exactly what I was feeling, and made it poetry. Elvis was so real to me because he knew my suffering. It was a very personal experience, and helped shape me as a songwriter. Ah yes, my first Elvis recording as a writer (“I Gotta Know”). What a thrill. I was in Nashville when Elvis was recording one of my songs and, even though I was good friends with his producer, Felton Jarvis, I couldn’t get in to meet the King. Those sessions were CLOSED! And, while I’m at it, I’d like to add that Elvis and the Rockabilly crowd that followed him were my inspiration to get into the “biz”. Thanks Artie. Great memories. I remember sitting on my couch in Chicago and watching the summer replacement tv show for the Honeymooners (The Dorsey Brothers Stage Show). That was Evis’s first TV appearance and I think he sang Shake, Rattle & Roll. Was it Bono that said, “Elvis was the big bang of rock n’ roll”. Well I felt it that nite. After I saw “Love Me Tender” multiple times, I went out and bought a $12 guitar, like a thousand other kids. Thanks again. p.s. Paul Evans: “I Gotta Know” was one of my favorite Elvis songs. Thanks. Hey, I know these guys, Alan and Paul, so I realize that I am in very good company as I post these comments. 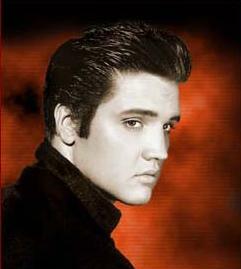 Artie, this is truly a special gift for Elvis fans. I actually consider it a wonderful Elvis adventure! 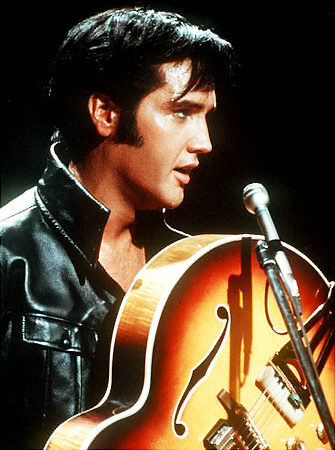 The Top 20 Elvis Music Videos Of All Time! WOW!!!!! Okay, so maybe there are MORE then 20. But 20 is close enough. I’ll consider the extra ones “bonus videos,” similar to the “bonus tracks” which I add to my radio interview shows. I must tell you that by visiting this page, which puts everything in such a wonderful format, I was able to relive some of the best moments of my life. And yes, in my case, I am old enough to have lived during those wonderful “early Elvis” days. This is truly an incredible tribute to the King and I know, Artie, how much you valued the contributions of Scott Shannon, Eddie Hodges, Bobbi Cowan, Alan O’Day and Steve Binder. All involved deserve a multitude of kudos and then some. I personally am glad that you chose NOT to put the videos in some sort of artificial “rank order of greatness.” I have nothing against countdowns, mind you. After all, I worked for Casey Kasem for 15 years on American Top Forty. But I too often have problems with countdown rankings which, less face it, are extremely subjective. Putting them chronologically was, in my view, a very intelligent choice. In this way you can truly get the flavor of a “This Is Your Life, Elvis Presley”! 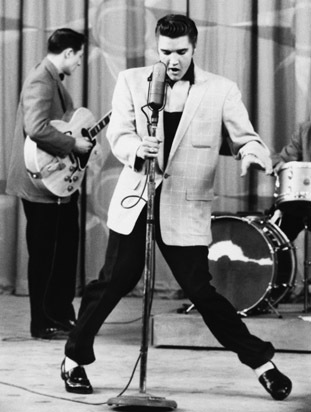 I must humbly plead guilty to actually liking Elvis’s highly-criticized performance of “Hound Dog” on the Steve Allen show, even though some have stated that it may have been the single most embarrassing moment in Elvis’s career and Elvis himself was not particularly thrilled with it. 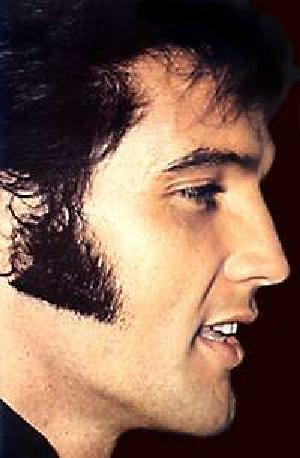 Despite that, I personally thought that appearance showed the “fun” side of Elvis and I have always enjoyed it. “Hound Dog” is a great song but, let’s face it, it’s not all THAT serious, so what was the big deal about having Elvis perform it in somewhat of an unusual setting? And the fact that people still talk about it today can’t be ALL bad, can it? Artie, you have done so many wonderful things over the years but I can tell you that you are going to have a tough time topping THIS. Elvis fans throughout the world owe you and all those who helped you create this tribute to the King an incredible amount of gratitude. Did Elvis Presley make a disparaging remark about blacks? Good to see the love being spread on here! TCB Elvis fans! Fantastic to see the love being spread in these posts! TCB Elvis fans! Elvis was never a racist. People always gotta hate. He’s the king baby! « “WHEN BAD GIRLS GO GOOD…DOES ANYBODY OUT THERE REALLY CARE?